I am a British wife; mother; grandmother … with a keen interest in family; local; national; and international history. Before March 2015, I did not know who put the poppy on my lapel! Were it not for a fellow local historian in my locality of Essex (UK), Chris Stanfield, acting as linkman between myself and a Canadian lady Mrs. N. E. MacFarlane (R.I.P. Nancy – you are no longer anonymous! ), I admit I would have remained oblivious to the historical realities surrounding Madame Anna A. Guérin. This Canadian lady was pivotal in me taking this quest forward. Credit must go to Nancy MacFarlane who dropped the Madame Guérin/poppy mantle for me to pick up. After learning that Nancy had died on 28 September 2015, I was pleased that she saw her dearly-held quest come to a conclusion before she passed. It is intended that a more fitting tribute to Nancy will follow soon. I am documenting all I am discovering about Anna Guérin – since her cause was taken up in March 2015, new information continues to come forth. It is hoped that the facts speak for themselves. I know, for sure, that more facts about Poppy Lady Madame Guérin are sitting waiting for me to find. I am continuing to update chapters as and when I learn something new or when I have a mind to expand on what has already been written e.g. replace a couple of quotes with a whole article. It may not be surprising to learn that, by the very nature and purpose of informing, many transcribed newspaper articles and passages of text contain repetition of facts. It is hoped that all, together, will go to illustrate the magnitude of Madame Guérin’s work. I make no apologies for digressing from the poppy ‘path’ on occasion (giving facts about other people connected with the story etc) – by doing so, I feel it has offered a much deeper look into Madame Anna Guérin’s life; raison d’être; and associates. Some of these “other people” have more written about them, than others. It has to be noted that, regardless of the person concerned, the details given about any individual are just a snap-shot of their lives. It should be evident that these are not complete portrayals. In my own amateur way, I have striven to be as accurate as possible whilst writing about Madame Guérin, her poppy idea and everything found associated with that … I hope I have succeeded in this quest. What I have written has been created in good faith. My ethos is: if people and facts are to be remembered and not lost, sharing must play a pivotal role. Thus, here I am … sharing. I am sure that parts may send some of you to sleep but it has been my intention to tell as many facts as possible, in order that a reader is as fully informed as possible. I have no doubt that there are errors to be found and I would appreciate any contact in this regard – I thank you now, in anticipation. Emphatically, I thank every person; library; museum; newspaper; university; etc who has taken the trouble to place information on the internet for me to discover. Additionally, I thank every individual who went “the extra mile” for me – whether by means of their professional role or in a private capacity. I am indebted to everyone listed in the chapter: ‘THANKS AND ACKNOWLEDGEMENTS : SOURCES’ – if I have omitted to list someone, I shall be mortified but please draw my attention to it because it has not been intentional. Without the aforementioned sources, I could not have been able to collate the facts. The most deserving of thanks is my husband … whose patience and love is immeasurable! As aforementioned, many people have helped me with the research into this subject and, in return, I am more than happy to help others who wish to use any details as an educational resource – this is the purpose of this website … to enlighten. If anyone thinks something is worth copying, I hope I am worthy of being credited. I shall be pleased to help, if asked. That said, please respect the fact that some images depicted on this website belong to others and are labelled accordingly. Out of respect/legality, permission to use any of these should be sought from the respective individuals or institutions. In November 2015, I now know who put the poppy on my lapel! German soldiers and civilians were obviously experiencing the same connection with the fragile poppy bloom. They were emotionally stirred by the symbol of the poppy also, contemporaneous with their enemies. 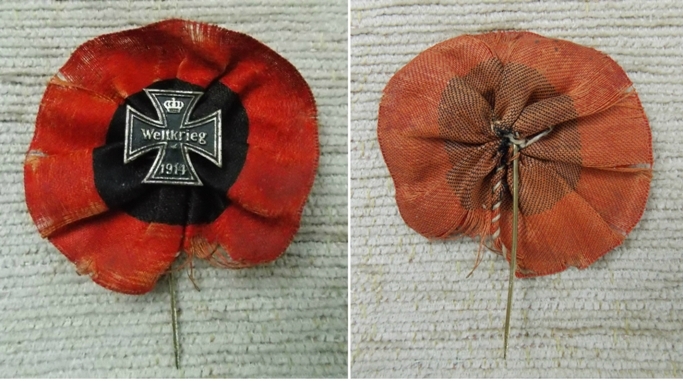 In remembering those who fell on the First World War battlefields, the poppy was neutral – it encompassed every nation. German WW1 Poppy Pin: World War/”Weltkrieg 1914”. Courtesy of Heather Anne Johnson. Poppies in a Somme field, 2015. Courtesy/© of D. & J. Thomson, La Boisselle, France (http://www.number56.co.uk/).